LAKELAND VIEW Guest House in KESWICK. provides clean and comfortable accommodation with a warm welcome and free off-road private parking. A truly unique property, formerly a 17th century toll cottage, has been developed into a convienent and well located Guest House. LAKELAND VIEW have three ensuite rooms, with the recently refurbished Room 3 offering Twin or King bed option. 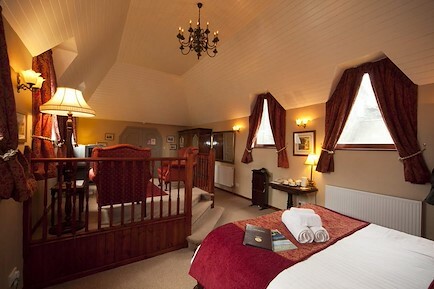 All the rooms are on the first floor, and offer magnificent views of the surrounding mountains and fells. All rooms have flat screen sky tv, free wifi, hairdryer and refeshment tray, including bottled water. Janet & Chris will gladly fill your flask with fresh tea or coffee free of charge. FREE PRIVATE PARKING is allocated for each room at the rear of the property. Janet & Chris take pride in offering a high standard of hospitality and aim to ensure that all guests have an enjoyable and memorable stay. They are also Ambassadors of the Theatre by the Lake and have discount vouchers available. LAKELAND VIEW is ideally positioned, it is only a few minutes stroll into Keswick town with its many attractions, and a ten minute walk to the breath taking shores of Derwentwater. At Lakeland View you can start the day with a delicious cumbrian breakfast and at the end of the day relax in a comfortable, cosy bed. Your enquiry will be sent directly to Lakeland View. Please fill in as much detail as you can.